Calls for a commitment from all media outlets to stop commenting on politicians’ appearances. Girlguiding has launched a campaign encouraging all young women to vote, but is concerned the continual objectification of female politicians and media focus on what politicians look like is sidelining girls from the political conversation and putting young women off engaging in politics. And as reporting of the General Election swings into action, Girlguiding – the UK’s leading charity for girls and young women – has called for a commitment from all media outlets that they will stop commenting on politicians’ appearances. The appalling ‘Legs-it’ headline – referring to a meeting between the Prime Minister, Theresa May, and Scotland’s First Minister Nicola Sturgeon – and constant editorial features detailing politicians’ outfits are clear examples of this. This call to media outlets comes as new research by Girlguiding reveals that two fifths (41 per cent) of girls aged 9 to 16 think there has been a rise in media sexism in the last six months and over a third (39 per cent) of these girls saying it has knocked their confidence. 3 – Recognise the diversity of young women’s voices including those who are too young to vote now but will still be affected by the decisions of the next government. Girlguiding wants the media to engage girls and young women in the political conversation, recognise their diversity and represent female candidates fairly – focusing on their policies and manifestos, not their ‘pins’, pointy heels and make-up. 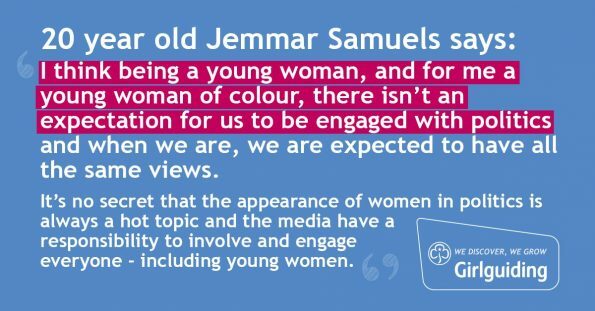 Jemmar Samuels, age 20, a Girlguiding youth panel member from London, said: “I think being a young woman, and for me being a woman of colour, there isn’t an expectation for us to be engaged with politics and when we are, we are expected to have all the same views. “Media sexism worries me,” Hannah Stubbs, age 20, a Girlguiding youth panel member from Swansea said. “I would like to see all politicians treated in the same way in the media and for the focus to be on their policies and views instead of what they’re wearing that day. “The media definitely have a responsibility to engage young women in voting. “Sexist depictions of female politicians in the media put me off engaging with politics,” Emma Taggart, age 16, a Girlguiding youth panel member from Northern Ireland said. “Focusing on a politician’s appearance instead of want she has to say sends the message that even women in the most powerful roles in the country aren’t taken seriously. And Kathryn Elswood, age 20, a Girlguiding youth panel member from Essex, said: “The media has a huge impact on our everyday lives, shaping our view of the world and current events. Throughout this 2017 election campaign, Girlguiding will be calling out instances of media sexism on Twitter using #ForTheGirl. You could help them, by passing on their request to the editor of the media of your choice, and by joining in on #ForTheGirl.